Big Fish - Big Smiles! Sharon Clarkson, (RN Surgery Clinic, Ketchikan) is the awesome Fisherwoman. It was her second fish caught ever. 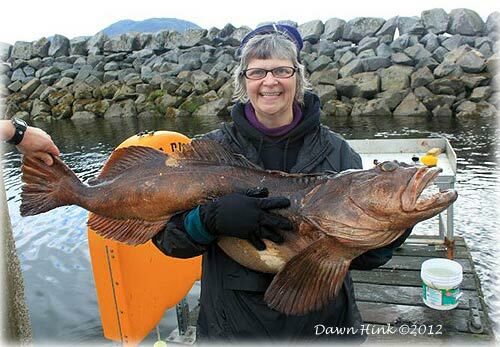 She was able to bring in this Ling Cod with the help of the photographer's husband, William Hink. It was 47 Pounds, 48 Inches long. (Dawn Hink said they looked it up on fish and game, and they have been sighted up to 5 feet long, this was four feet! Alaska: Beluga Whale Calf Rescued by the Alaska SeaLife Center By Mary Kauffman, SitNews - The Alaska SeaLife Center (ASLC) rescued a stranded male beluga whale calf from Bristol Bay recently. Alaska SeaLife Center President and CEO, Tara Riemer Jones told SitNews today that the calf is doing well. However due to its age, it is at risk of complications and staff remain guarded yet optimistic. 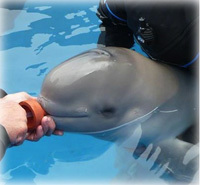 Monday marked the two week point since the beluga calf's was admitted to the ASLC's rehabilitation center. The calf was spending a lot of time seeking attention from his caretakers Monday and it was noted that he loves to be rubbed all over and swim in between his caregivers' legs. The solitary animal estimated at two to three days old, was found near the Diamond O Cannery in Naknek Monday, June 18. The calf was first spotted after a large storm, and no other beluga whales were observed in the immediate vicinity. The animal repeatedly returned to shore after being encouraged to return to the open ocean. It was picked up after rescuers called the Alaska SeaLife Center, who received authorization from the National Oceanic and Atmospheric Administration (NOAA) to attempt a rescue. Ketchikan - National: 'Ghost Click' malware may knock thousands off internet Monday Edited by Mary Kauffman, SitNews - Warnings about the "Ghost Click" Internet problem have been around for months, but thousands of Americans may still lose their Internet service on Monday, July 9th, unless they do a quick check of their computers for malware that may have taken over their computers more than a year ago. The problem began when international hackers engaged in a massive and sophisticated Internet fraud scheme that infected with malware more than four million computers located in over 100 countries. Of the computers infected with malware, at least 500,000 were in the United States, including computers belonging to U.S. government agencies, such as NASA; educational institutions; non-profit organizations; commercial businesses; and individuals. Today, according to the FBI over 60,000 computers in the U.S. are believed to still be infected. This DNS-Changer malware, around for over a year, secretly altered the settings on infected computers enabling the hackers to digitally hijack Internet searches and re-route computers to certain websites and advertisements, which resulted in the defendants to be paid. The hackers subsequently received fees each time these websites or ads were clicked on or viewed by users. The malware also prevented the installation of anti-virus software and operating system updates on infected computers, leaving those computers and their users unable to detect or stop the hackers’ malware, and exposing these computers to attacks by other viruses. DNS (Domain Name System) is a critical Internet service that converts user-friendly domain names, such as www.sitnews.us, into numerical addresses that allow computers to talk to each other. Without DNS and the DNS servers operated by Internet service providers, computer users would not be able to browse websites or send e-mail. On March 12, 2012, to assist the victims affected by the DNSChanger malicious software, the FBI obtained a court order authorizing the Internet Systems Consortium (ISC) to deploy and maintain temporary clean DNS servers. This solution is temporary, for the purpose of providing additional time for victims to clean affected computers and restore their normal DNS settings. Most victims don't even know their computers have been infected, although the malicious software probably has slowed their Web surfing and disabled their antivirus software, making their computers more vulnerable to other problems. It is important to note that the clean DNS servers that have been in operation since March will not remove the DNSChanger malware - or other viruses it may have facilitated—from an infected computer. The clean DNS servers will be turned off on Monday, July 9, 2012, and computers still impacted by DNSChanger may lose Internet connectivity at that time. The FBI said internet providers may come up with technical solutions that they will put in place Monday that will either correct any problem on the providers' end or provide information to their customers when they call to say their Internet isn't working. If the Internet providers correct any server problem they have, the Internet will work; however, the malware will remain on victims' computers and could pose future problems. Science: Remote Siberian Lake Holds Clues to Arctic and Antarctic Climate Change; Fates of polar ice sheets appear to be linked - Intense warm climate intervals--warmer than scientists thought possible--have occurred in the Arctic over the past 2.8 million years. That result comes from the first analyses of the longest sediment cores ever retrieved on land. They were obtained from beneath remote, ice-covered Lake El'gygytgyn (pronounced El'gee-git-gin) ("Lake E") in the northeastern Russian Arctic. The journal Science published the findings in June. DAVE KIFFER: Sometimes You Do Have to Shovel Rain - So our climatically-challenged cousins in Juneau are crying because they had 6.69 inches of rain in June. It was the wettest June on record in the Capital City. In Ketchikan we had 9.85 inches of rain in June making it something like the 379th wettest June on record. For the record, the wettest Ketchikan June was in 1984 when 14.32 inches was recorded. We’ll have to really go for the precipatory (rhymes with purgatory) gusto if we want to set an all-time record for July. Some 28.36 inches was recorded in 1914, although if you ask me someone probably drizzled a beer or two into the rain gauge that year because 28 inches sounds a wee bit high! Even for Ketchikan. After all, last year’s delugiously downsodden Julytember was only a hair under 12 inches. It’s hard to imagine that if 28 inches really fell in July of 1914, there was anyone still left in town by August 1. We would now be having this conversation in a locale that had a little less liquid sunshine to deal with. Which if course is just about anywhere else on earth that is not a mountain on Kauai or a village in the path of an Indian monsoon. Speaking of Augustober, it gets even worse with 33.9 inches being recorded in 1912. Once again, you wonder if it was some inadvertent metric misconversion. Still it does get wet here. If you don’t believe me, ask the visitors. I had another one ask me the other day if ever stopped. I resisted the urge to tell her that I don’t know because I’m only 53, I’ve used that one too many times before. So I just smiled and shrugged. It is a rainforest after all. Just one without the pretty birds and 20-foot-long snakes to make it interesting. Update in Progress. Thanks for your patience.